A few Churchill Downs ponies during Derby week. 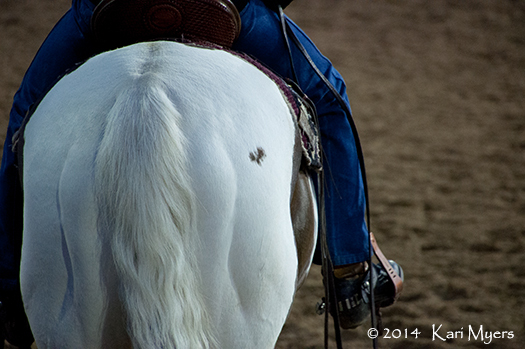 May 1, 2014: An early morning pony. May 1, 2014: A pony and his charge wait by the rail. I’m pretty sure some gossip was involved. 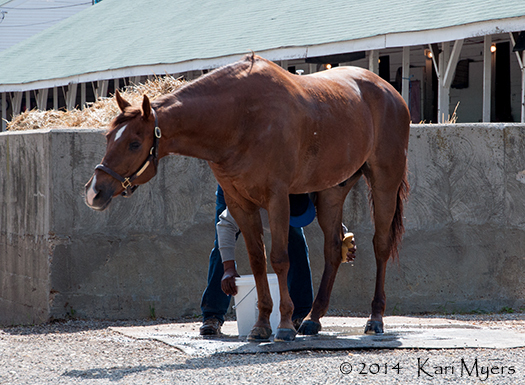 May 1, 2014: Red the stable pony gets a bath. Such a good boy to stand around without even a lead rope. 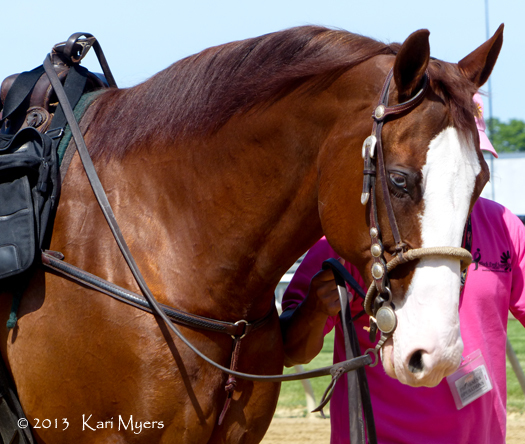 Some of the most colorful characters at the track are the lead ponies. Pimlico’s riders are fantastic at crowd interaction, and their horses will accept peppermints, carrots, and apples between races. It’s awesome to see kids run to the rail and pet horsey noses or get their hands slobbered on, because you know they’ll always remember that. I certainly would! Hopefully they’ll grow up to love horses, too! 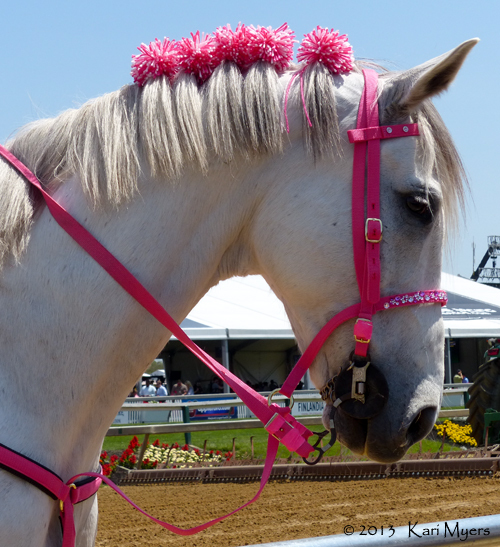 May 17, 2013: This is the “pony” that Donna Brothers rode during her telecast coverage of the Preakness. He belongs to D. Wayne Lukas’s barn, and when I asked one of his assistants what this big, blue-eyed gelding’s name was, I was told, “His halter says Starbuck, but we all just call him The Pony.” I’ve heard from others that they call him Diamond. May 17, 2013: You’ve got to scratch your itch whenever you’ve got the chance! May 17, 2013: This is Dr. Noble, although he might not feel very noble in all the sparkly pink for cancer awareness. He is a retired Thoroughbred (Meadowlake x Launching Shot, by Relaunch) who only ran 4 times back in 2003. Now he spends his days ponying current race horses back and forth to the gates at Pimlico–and accepting apples and peppermints from anyone who’s got them. Click here to see Dr. Noble dressed up in yellow for the Preakness in 2011. 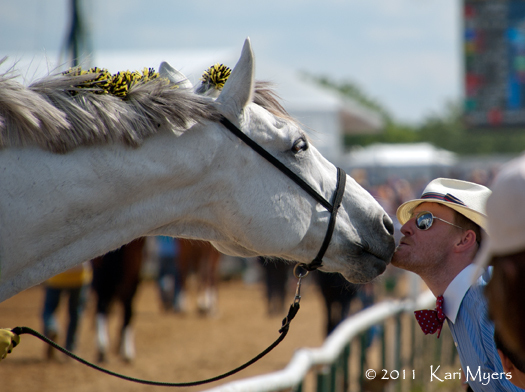 May 21, 2011: Dr. Noble, a retired race horse turned Pimlico pony, accepts apples, peppermints, and kisses from the crowd before the Preakness. 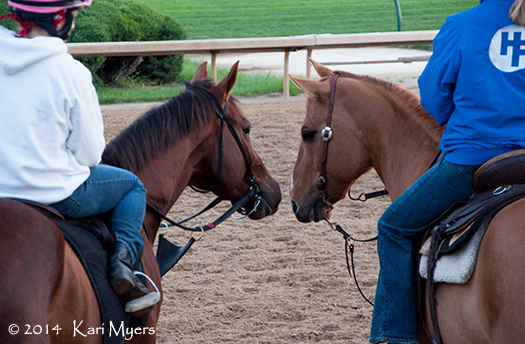 Sometimes my favorite horses on the track are the lead ponies. 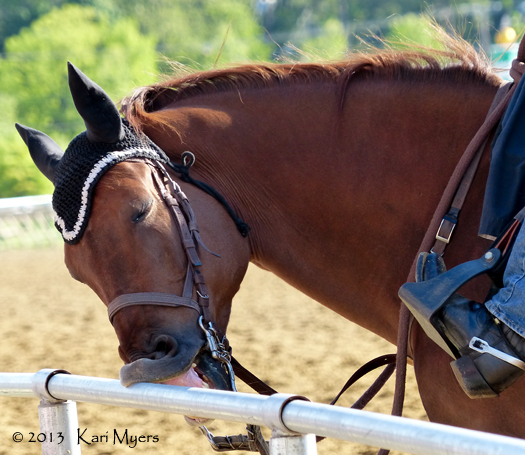 At Pimlico, they come right up to the rail and many of the riders will remove their bridles between races to let them eat treats from the crowd. People come prepared with baggies of apple slices, carrots, peppermints, and the random potato chip. The horses love it! This particular gelding was a race horse himself and ran under the Dr. Noble. He won once out of four starts in Florida, and ended up being retired and eventually retrained as a pony. He’s a favorite at Pimlico!